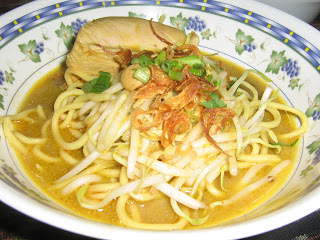 OK .. as mentioned in yesterday's post, I wanted to serve my guests Mum's Mee Soto and I did. Sifu Sainah (dats my mum by the way) .. hehe .. was at my house to give me a hand at cooking Mee Soto as it is my first time. Press the end of lemongrass with a pestle and put in the lime and salam leaves and put them in the pot. Add some salt and sugar then add enough water and leave it to boil on high flame. Once it has started to boil, lower the flame and put in the chicken pieces and leave it to coook. Add in the coconut milk and sweet soya sauce and leave it boil again. Leave it for a moment and turn off heat. 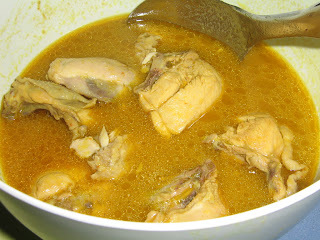 Serve chicken soup hot with noodle or vermicelli or rice cakes and blanched beansprouts. Top it off with condiments such as fried crispy shallots, chopped cilantro and spring onions and "sambal kicap" - made of ground birds eye chillies, garlic and sweet soya sauce. Oh yeah .. Mum's Mee Soto was also a hit with the guests .. really kewl stuff. Hi. I have been looking for a yummy Mee Soto Recipes for awhile. I noticed this recipe had coconut milk. I just don't remember the broth being thick like if milk was added.. Is that your mom's version?? ?